A Texas woman's Facebook post about a decoration at Hobby Lobby has sparked controversy. 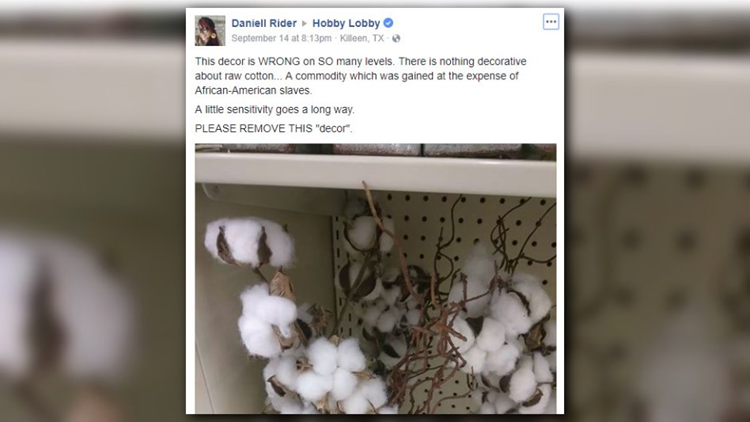 Daniell Rider of Killeen, Texas, shared a post on Hobby Lobby's Facebook page which included a photo of glass vases housing stalks of cotton. The store is selling the cotton vases as a decoration. "This decor is WRONG on SO many levels," Rider wrote in her post. "There is nothing decorative about raw cotton... A commodity which was gained at the expense of African-American slaves. A little sensitivity goes a long way. PLEASE REMOVE THIS 'decor.'" The post quickly went viral. In less than a week, more than 210,000 people commented and nearly 20,000 shared it. A number of viewers criticized Rider for the post, arguing that cotton itself is not offensive. "It's a plant," one user commented, according to AL.com. "Chill." "All those who are offended [by] cotton being a decoration need to quit buying any product made of cotton!" another added. "What difference does it make if it's a decoration or part of a product. You're being hypocritical if your offended by cotton being a decoration and not offended by any product made of cotton." More readers shared their thoughts on the Mad World News Facebook page. "People need to get over themselves and stop being so sensitive to stupid/irrelevant things!!" one user wrote. "There are far more important issues going on in our country, other then cotton on a stick!!! Sounds like someone is just looking to start something with an open Christian company, and of course get their 15 minutes of fame...pathetic!!" "Hobby Lobby is the best hobby store around," another commented. "Cotton is a natural product. If someone is offended by cotton, take a good look at your clothes. Probably cotton or cotton blend. Get over it. Life isn't all fun and games. Grow up." "Oh please," another user added. "Are you serious. Breathing my air is offensive. And doesn't that sound stupid. Come on people this is a little extreme I had to read the article to find out why it was so offensive. Grow up." The post comes following another controversial incident in which the president of Lipscomb University in Nashville, Tennessee, reportedly used cotton stalks as a centerpiece at a dinner for African-American students at his home. Several students complained about the centerpiece being offensive. Lipscomb President Randy Lowry apologized for the decoration following the incident, saying that he could have approached the situation "with more sensitivity." "I sincerely apologize for the discomfort, anger or disappointment we caused and solicit your forgiveness," Lowry said.